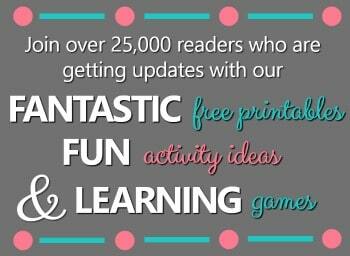 By Shaunna Evans 2 Comments · This content may contain affiliate links. Teaching phonemic awareness is a key focal point in early literacy instruction. Often these activities can be done in a very short amount of time, and they can be very fun for kids if you include a bit of movement. Sometimes we do phonemic awareness activities as a quick activity during circle time or small groups. 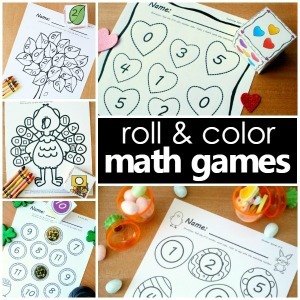 Other times we introduce the activities in a whole group setting and then provide a printable version that kids can do more independently in literacy centers. The build a snowman winter phonemic awareness activity is a good example of that. In this post I’m sharing a spring inspired Easter Syllables Phonemic Awareness Activity that will help preschoolers and kindergarteners practice counting and segmenting the syllables in words using picture prompts. 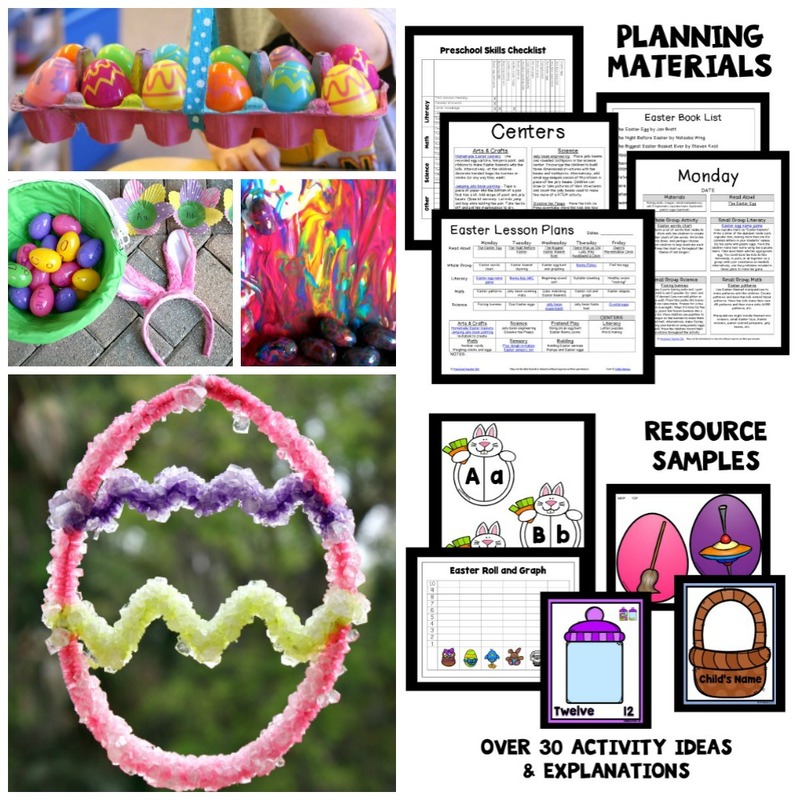 FIND EVEN MORE EASTER THEME ACTIVITIES IN OUR PRINTABLE EASTER LESSON PLANS. 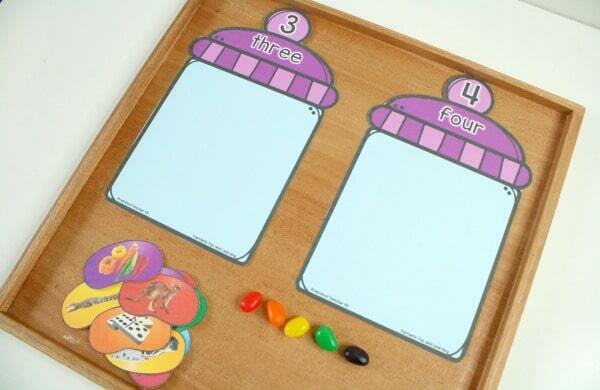 This free printable Easter Syllables Phonemic Awareness Activity includes candy jars labeles with the numbes 1 through 4 and sets of individual jelly beans with pictures related to words with one, two, three, or four syllables in them. 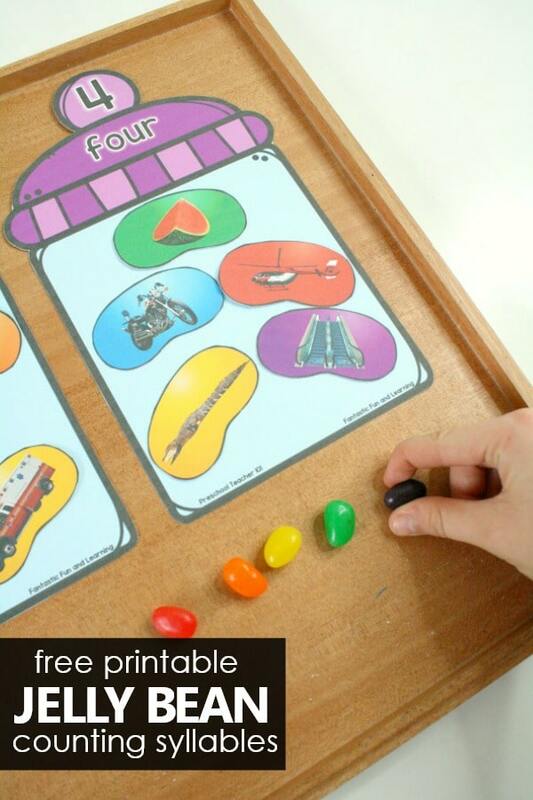 I cut these printable items out and then set the activity up with real jelly beans. 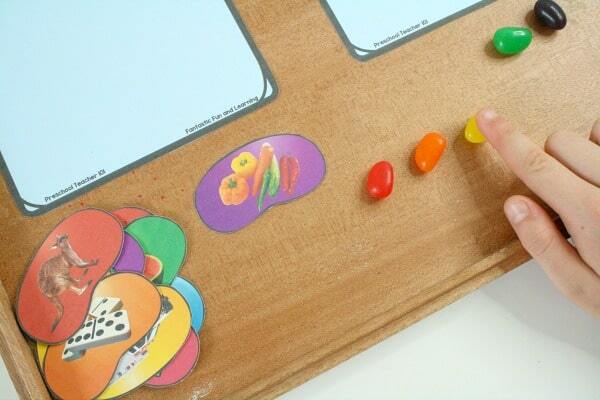 However, if your program does not allow the use of food you can certainly use buttons, pom poms or a similar manipulative in place of the jelly beans. Watch this short video to see the steps I follow when introducing this phonemic awareness activity to kids. Phonemic awareness is related to how we manipulate sounds and parts of words in our minds. 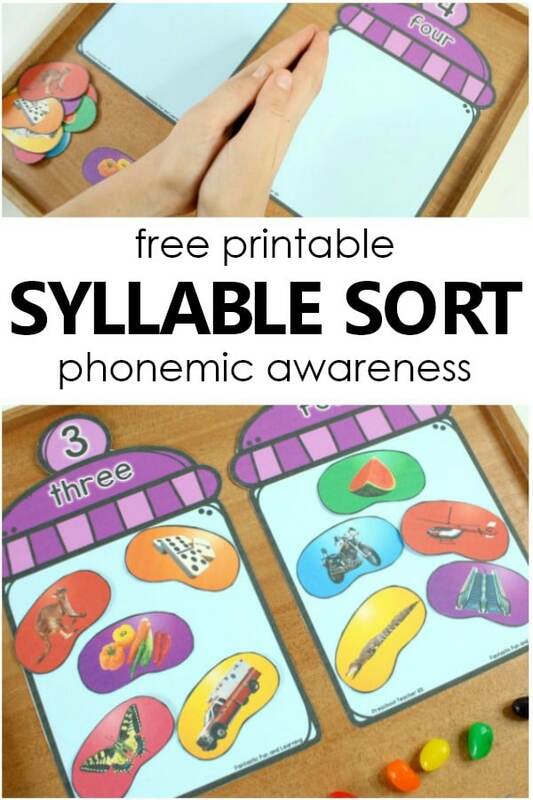 It does not involve seeing the actual word (so do not add the written word labels if you are focusing on phonemic awareness). Instead help kids use strategies to identify and segment the parts they hear in the word orally. I like to start by having kids choose a jelly bean picture prompt. Then we clap to show how many syllables are the word. As the kids count they are orally saying the parts they hear in the word. We are not counting syllables yet, just warming up our ability to break apart the syllables in the word. For a fun Easter twist we then bunny hop the syllables. Kids make a bunny with their fingers and then they hop to segment that syllables in the word another time. Now we’re ready to count the syllables in the word. This is where we use the manipulatives. 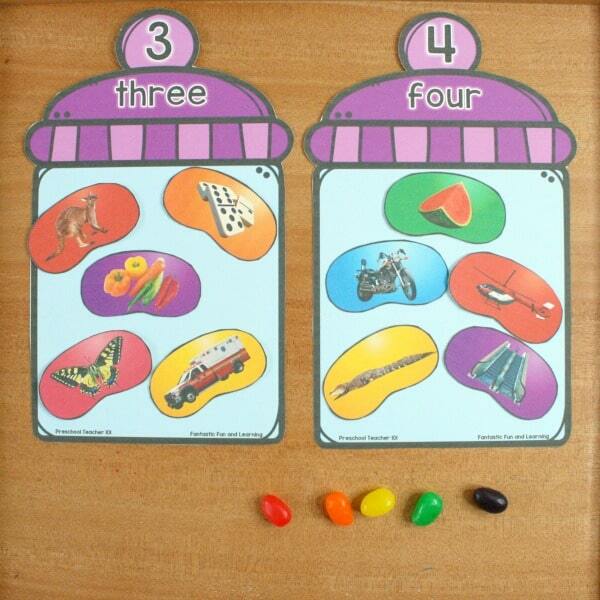 As kids say the individual syllables in the word they pull a jelly bean down for each syllable. 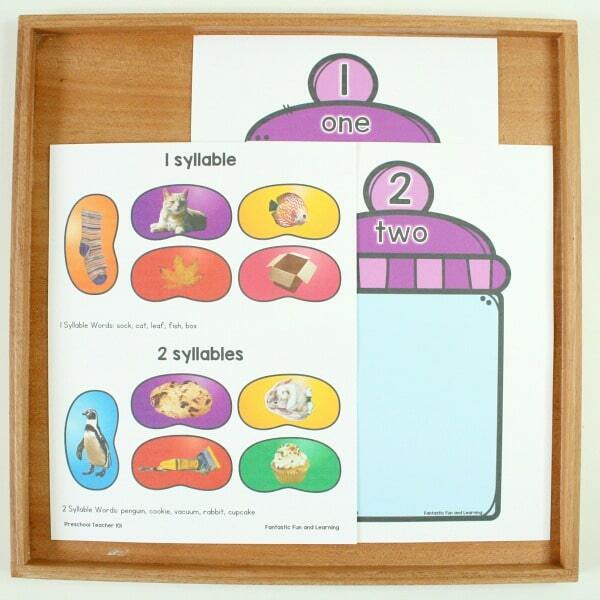 When they are done they can easily count how many syllables were in the word. Then they place the jelly bean picture prompt in the appropriate candy jar, and we repeat the process with additional jelly bean prompts. As kids get practice they’ll need less and less support and can move toward segmenting and counting the syllables on their own as a literacy center activity. You can differentiate the activity by including fewer candy jars or jelly beans if needed. Click this link if you do not see the pink download button above. The email will have a blue button that says “claim your download”. Be sure to check your spam folders, as sometimes the free download emails are directed there.